Sentinel Project partners with Colorado-based non-profit Space United, allows supporters to directly contribute to ‘humanitarian aerospace’ goals. The public perception of satellite imagery often conjures up visions of high-tech military hardware or the cloak and dagger world of espionage and international intrigue. But satellite imagery is a burgeoning field whose increasing economic accessibility offers unique opportunities to put commercial imaging satellites to use in humanitarian pursuits. The Sentinel Project has partnered with Colorado-based non-profit Space United to produce satellite imagery which will be used to further our goals of developing a viable ‘humanitarian aerospace’ sector. Space United has already produced satellite imagery of refugee camps in Jordan and agriculture conditions in Kenya with other partnered organizations. Satellite imagery produced from the partnership between the Sentinel Project and Space United has provided strong evidence which allegedly shows the destruction of a Baha’i cemetery in Sarandaj, Iran. The damage occurred on 16 December, 2013 and had previously been reported only through unnamed reports and photographs which the Sentinel Project was unable to verify as authentic. The satellite imagery provides some indication of a serious disturbance though we are quick to note that the images do not indicate which party was responsible for the destruction. 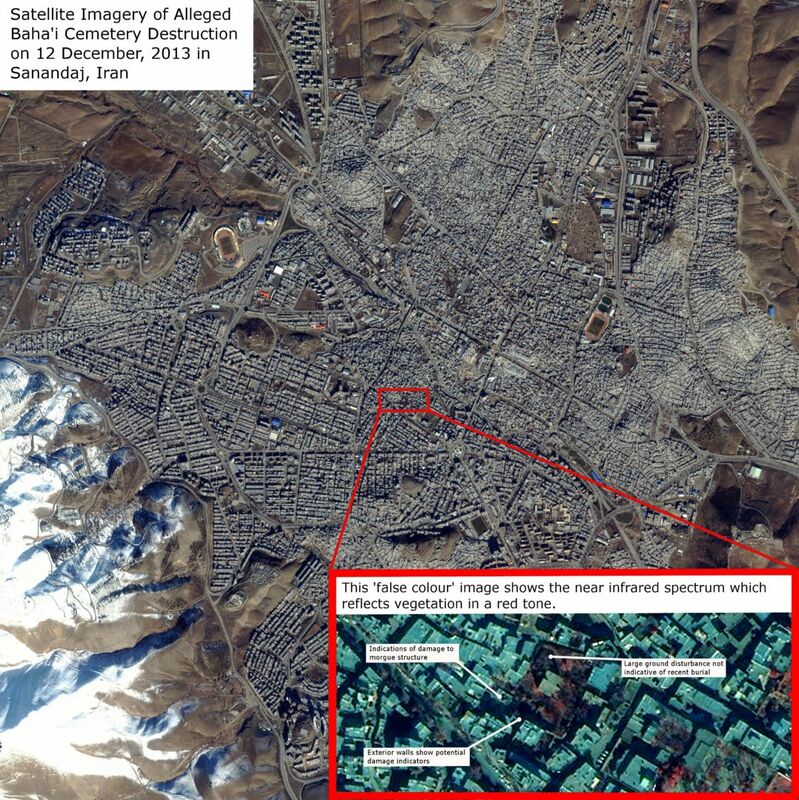 The Iran imagery demonstrates just one of many ways satellite imagery can be used for humanitarian purposes. The growth and density of prison camps, the destruction of civilian infrastructure, the movement and concentration of armed groups and the situation status of zones not accessible to humanitarian staff are some of the operations we are looking to implement with this resource. If you would like to be part of the Sentinel Project’s satellite imagery program you can contribute by purchasing a Sentinel Gift or making a direct donation.